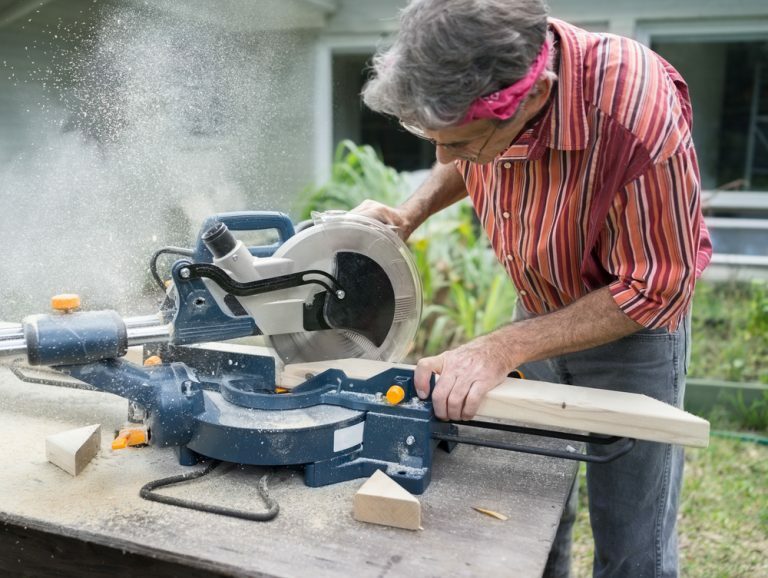 Regardless if you are a professional contractor, woodworker, or just someone that likes to tackle their own projects, a miter saw is one of the best tools that you can have in your workshop or at the job site. Miter saws use a circular saw blade and are primarily used for cross-cutting (instead of longer rip cuts) while offering the flexibility of cutting at precise angles with a bevel. This ability to cut at angles makes it ideal for trim work, crown molding, picture frames, and window casements. With all of the options that are available, picking the best miter saw can be a little overwhelming. That’s where we come in! My miter saw reviews do all of the hard work for you by taking a good, hard look at several of the top models on the market. At Tool Tally we help you figure out which is the right choice for you…so let’s get the ball rolling (or the blade cutting…however you want to look at it)! Disambiguation: Miter Saw Vs Chop Saw: Which one is right? 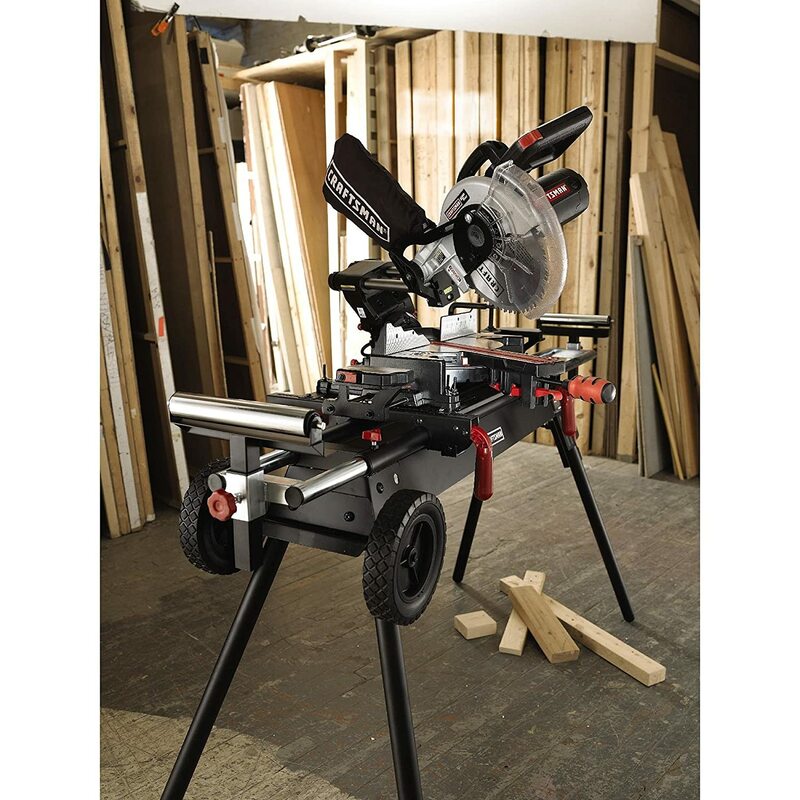 Do you need a Miter Saw Stand? 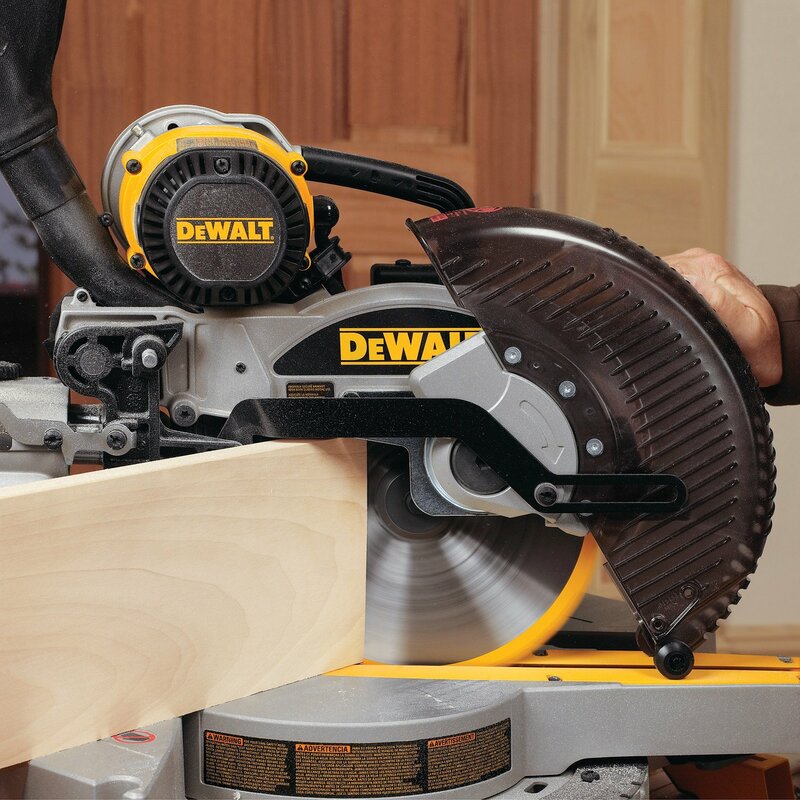 Based on our research, the Dewalt DWS780 rises to the top to be named the best overall miter saw on our list. Dewalt is one of the most well-known names in the power tool industry, and the DWS780 is a great example as to why they have such a high reputation. This unit has all of the power and flexibility that you may need regardless of how intensive your projects may be. Cutting wider workpieces is extremely easy thanks to the 12-inch blade that is mounted on steel slider rails with precision linear ball bearings for wider cutting capacity. Ample power for just about any project is provided with a powerful 15-amp motor that runs at 3,800 RPM. You have positive stops at all of the common angles allowing for quick, yet precise cuts, with an override lever which allows you to choose any blade position you need. A unique feature is the CUTLINE™ Blade Positioning System, which casts a shadow that represents where the blade will cut on the workpiece. The shadow gets more detailed as you lower the blade so the cut line is very easy to see – and accurate at the same time. The dual bevel capability makes handling complex cuts a breeze and saves you time when cutting longer pieces that are hard to turn around. It also has up to 60° of miter adjustment with detent positions for quick and easy adjustments. Some users have mentioned issues with the cutting accuracy, but that can be corrected with proper blade adjustments. In addition, there have been comments about how rugged the build is; it may be more appropriate for general use as compared to the hard use needs of a professional. Throwing in an extensive 3-year limited warranty on top of it all, the Dewalt DWS780 has all of the features and ease of use to be our #1 pick for most uses. The Bosch GCM12SD comes with all of the ruggedness, ease of use, and quality that is to be expected from most Bosch power tools. 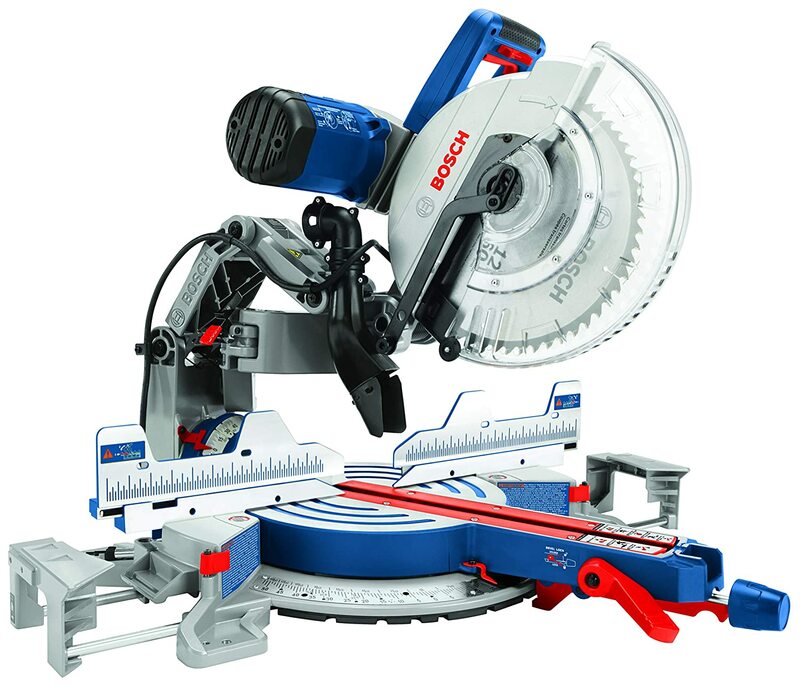 It comes with a 12-inch blade, but with the addition of the Bosch Axial-Glide system you can make cross cuts up to 14”. This isn’t a traditional slider saw, however. The Axial-Glide system is an impressively engineered articulating arm that folds in and out while keeping the saw head location accurate. The motion is very smooth, and it allows for space savings since there are no rails. This alone may be worth the price of admission if you need a wider cutting capacity. Cutting even thicker, wet lumber is not an issue as the GCM12SD comes with a powerful 15A motor that runs at 3,800 RPM. Miter capability (with detents at common angles) is up to 60°, and with a double bevel that will accommodate up to 45° (again, with detents) you can get through those more complex cutting jobs in less time. All of the bevel and miter adjustment levers and scale indicators are conveniently placed in front for easy operation. Sawdust doesn’t have a chance to make a messy work area as the GCM12SD has a dust collection system rated for up to 90% removal. One point we were a little disappointed with was the lack of an LED or laser marker for blade positioning, which is a common feature on many other models. That shouldn’t be a deal breaker for you though when you consider all of the other features this miter saw can bring to the table. Overall the Bosch GCM12SD has impressive features that should earn it a place in anyone’s tool collection. 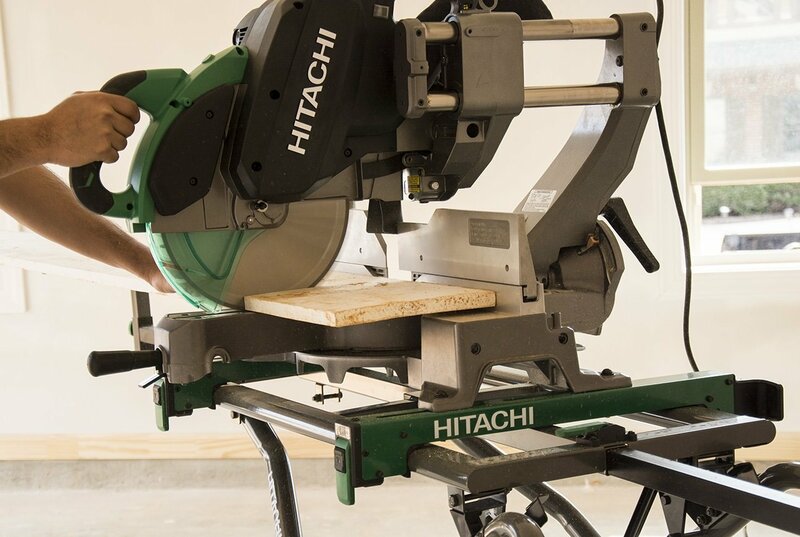 Combining features found on more costly models with a price that won’t have you breaking into your piggy bank, the Hitachi C12RSH2 may be the perfect tool for woodworkers that are on a budget. Longer cuts are a piece of cake thanks to the large 12-inch blade and a slider system that increases the cross cut capability to 12.25” total. The slider design itself is unique in that the rails are fixed, which reduces the rear clearance that is typically needed with most sliding compound miter saws. The sliding action can be a little hard and stiff but that can easily be fixed with some minor adjustments. Cuts are easy, quick, and smooth through even the thickest material with a 15A motor that runs at 4,000 RPM. With a range of up to 45° of miter adjustment and 45° double-bevel adjustment, making complicated compound cuts is quick and easy. As a dual bevel sliding miter saw with laser the C12RSH2 is that it is a great tool for general purpose work. The only thing that would make it more awesome is if it came with air conditioning. It would make a great addition to any personal workshop or home remodeling project. One thing that we try to do with our reviews is to take a look at the entire range of a particular type of tool. We aim to go from some of the most cost-efficient models with a smaller amount of features all the way to the units that have all of the options and benefits that you would expect at a higher price point. Based on our review, the Festool Kapex KS 120 EB finds itself firmly at the upper end the scale. It’s a high-accuracy machine that is at home in a high-end cabinet shop. The KS 120 EB is designed for use with a 10.25” blade, with the saw head mounted on a “rail-forward” design. This means that the rails are stationary and the saw head has linear bearings instead of the rails being mounted to the head and the bearings being in the saw housing. This design lets the rails sit forward in the overall envelope of the saw, greatly reducing the amount of space needed for installations in a workshop where the tools are close to a wall. Power isn’t a concern with a 13A capacity motor. Speed isn’t a concern either since the KS 120 EB has Festool’s unique MMC (Multi-Material Control) feature built in. The MMC allows for variable speed from 1,400 to 3,400 RPM. Not only that, but the speed is continuously monitored so that the RPM setting remains constant with the blade gets loaded. With the KS 120 EB you’ll always know where your cut will end up. Most models that have blade location systems use an LED (to cast a shadow) or a single laser guide. The KS 120 EB utilizes a dual laser configuration that is adjusted to the blade width, showing exactly what material will be removed. Miter capability up to 60° and double bevel capability up to 47° in either direction gives you the flexibility for the most extreme compound cuts without switching sides of the board. The bevel adjustment system is very robust and precise due to the rack and pinion design. Safety and ease of use was a big consideration with the KS 120 EB’s design. The FastFix system mechanically locks both the trigger and arbor, enabling one-hand blade changes. Dust collection and control is very efficient at up to 91% (when using the right Festool hose adaptors). The Festool Kapex KS 120 EB comes with many innovative features that make it, in our opinion, one of the most impressive and efficient miter saws we have seen. As a double-bevel sliding compound miter saw, the DW717 has earned a spot on our list for the best miter saws available for 2019. Miter saws are designed for a range of purposes. The models we have reviewed so far have had 12” blades to allow for larger cuts. The fact of the matter is that not everyone will be crosscutting a 14” or 16” piece of lumber. While having that added capacity isn’t necessarily a bad thing, it may simply not be needed. Manufacturers realize that, and the DW717 is geared towards smaller capacity jobs. Just because it has a 10” blade instead of a 12” doesn’t mean that it lacks power and capability, though. It has a 15A motor that runs at an impressive 4,000 RPM for clean and efficient cuts. The slider design will allow for 12-inch crosscuts, but that can be expanded to 14” using special setups. The slider system is designed so the rails travel with the saw head, so take care to leave some extra room behind it if you are planning on indoor installation. Miter capability is an impressive 60°, and the double bevel capability can speed up your time when making those tricky compound cuts. Both the miter and bevel adjustments have detent positions at commonly used angles as well. In addition to being able to handle the wider widths, this one has a tall fence for handling taller crown moldings. The DW717 does not come with any sort of blade positioning indicator, but Dewalt does sell a system separately that can be easily installed. Coming with a 3-year limited warranty, the Dewalt DW717 may be the miter saw of your choice for those jobs that may not need as much dimensional cutting capability. Table size small – may be hard to stabilize the workpiece. Budget-minded woodworkers know a good miter saw when they see one, regardless of the cost. 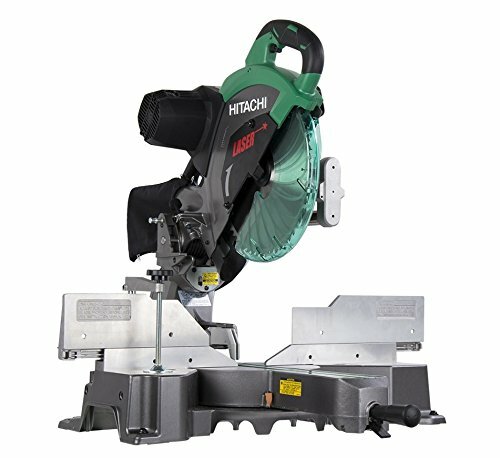 The Hitachi C10FCG miter saw, while not having as many features as more expensive models, still has enough capability to get the job done. Don’t let the price fool you – the C10FCG has a powerful 15A motor that runs a very impressive 5,000 RPM for clean and swift cuts. It also has a 10” blade (no slider mechanism, unfortunately) that is more than sufficient for cross-cutting smaller pieces of lumber. Miter adjustment ranges up to 52° in both directions, and the single bevel setup will let you go up to 45°. The difference with a single bevel is that you will need to flip your piece of wood over and run some subtraction in your head in order to create an opposite cut. Most miter saws are a single bevel, and what is unique about this one is that it is a single bevel compound miter saw which means you can make your angle cuts in either direction, but it Keep in mind that a single bevel miter saw can, for the most part, do the same cuts like a double bevel but it just might take a little longer. The base model C10FCG doesn’t come with any sort of blade positioning system. However, for a relatively small amount more you can upgrade to the C10FCH2 which has similar specifications. It also comes with a dust collector attachment as well. One big plus is the 5-year limited warranty – that’s quite a bit more than the majority of the miter saws on our list. 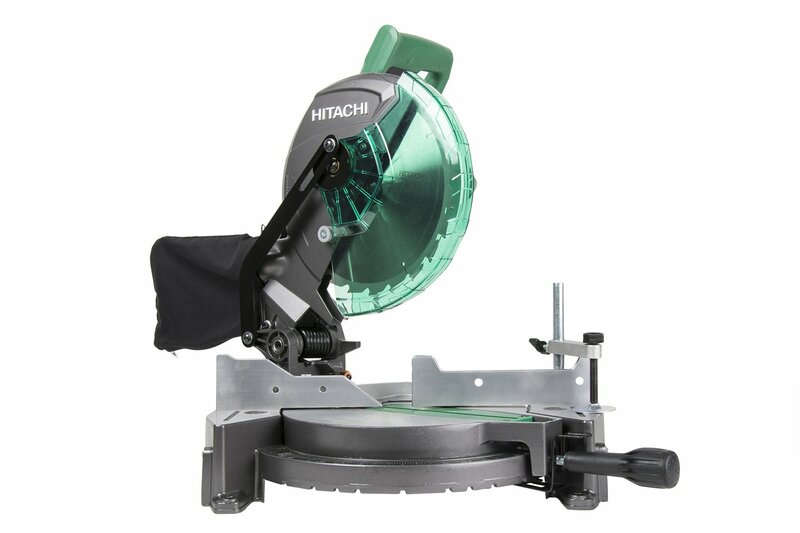 The Hitachi C10FCG may not have the most impressive feature set, but it would be a great miter saw for the weekend warrior that has a few minor projects to get done. The Makita LS1016 packs many of the features of more expensive units while keeping capability and functionality at the forefront. The LS1016 drives a 10” blade with a 15A motor rated at 3,200 RPM and has a soft start feature so startup isn’t so abrupt. A big feature is the integrated Electronic Speed Control which helps to keep the blade speed as constant as possible when cutting thicker pieces of lumber. The slider system was designed with cut accuracy in mind with six linear ball bearings to increase rigidity and smoothness of motion. The downside is that the slide rails are mounted to the saw head, meaning that you’ll have to have adequate room behind it in the case of indoor installation near your shop, basement, or garage wall. Miter cuts can be made from 0° to 60°, and bevel cuts range from 0° to 45° in both directions for easier complex cutting. The bevel lock in the rear, though, so it isn’t as easily adjustable as the other models on our list that have front-facing adjustment levers. Out of the box the LS1016 does not come with any sort of laser or LED for blade positioning, and you can’t buy it as an accessory. Your best option if you like the feature set is to upgrade to the LS1016L; this model has a precise laser line built in that can be adjusted to mark either side of the blade. The see through blade guard makes it easy to see where you are cutting without getting dangerously close to the blade. 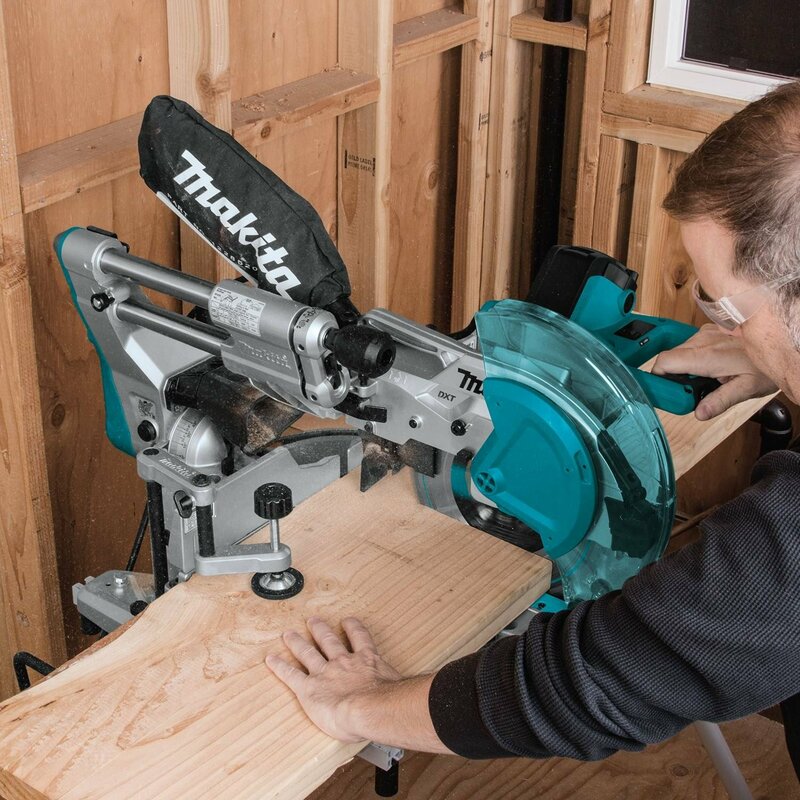 Thanks to its’ list of features, the Makita LS1018 is a strong contender for the mid-range miter saw that can get you through most woodworking projects. 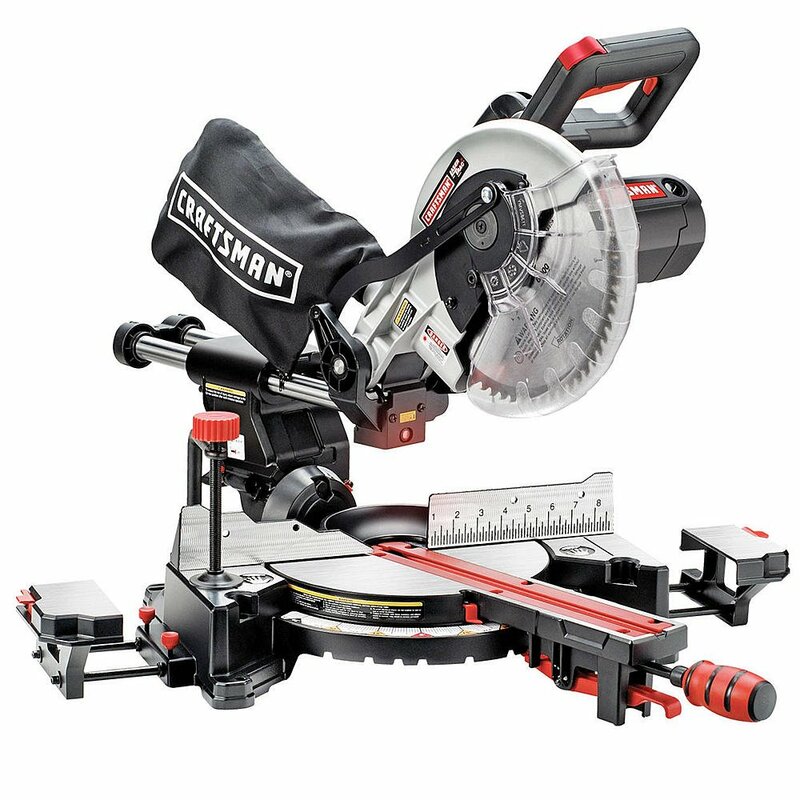 The Craftsman 21237 is a great miter saw for the general use of the hobbyist or for projects around the home, all at a price that won’t blow out your budget. The 10” blade will crosscut up to 12” with the integrated slider assembly, and it is powered by a 15A motor running at an impressive 4,800 RPM for quick and smooth cutting action. The miter capability reaches 50° in both directions, and the single bevel adjustment range from 0° to 50° gives you the ability to make the same cuts as you can on more expensive double bevel units (although it may take more time if the cuts are more difficult). A great feature for a miter saw in this price range is the integrated Laser Trac blade positioning system. It guarantees you an accurate cut line without ever having to be worried about the batteries running low (it runs off the internal power of the saw). It does have dust collection capability but it may not work as well as other models on our list. 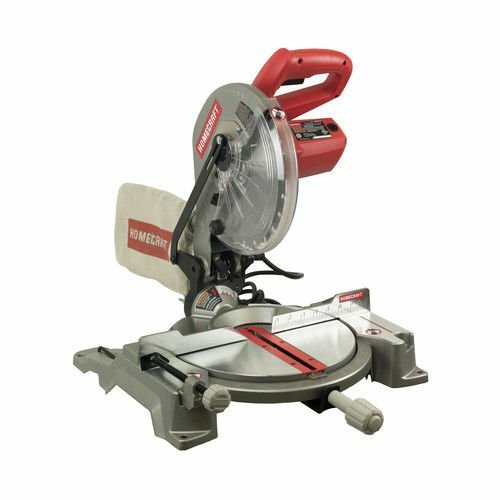 If you’re looking for a miter saw that isn’t pro level but still has enough features to get the job done, then the Craftsman 21237 might be right up your alley. Homecraft isn’t usually the first name that comes to mind when you think “miter saw”, but if you take a harder look at H26-260L you might just change your mind. Sporting a 10” blade (you may find that replacing the stock blade will give you better results) driven by a 14A motor rated at 5,500 RPM, the H26-260L is sure to give you clean, quick, and smooth cutting action. One drawback is the lack of a slider mechanism so your crosscut capability will be limited; if that’s a deal breaker for you then there are other models on our list that can accommodate your needs. Bevel capability ranges from 0° to 47° along with a miter range up to 45° in each direction (with stops at the most common angle settings), giving you much more capability than a traditional drop saw. The H26-260L comes with a laser for blade location – a great feature for a miter saw at this price level. It does run off of batteries instead of internal power, but that’s a very minor detail in our opinion. It does have dust collection capability but you may find that it doesn’t work as well as some of the other models we have reviewed. It’s lightweight and easy to move around if your projects take you outside of your shop or garage, and with a 5-year limited warranty, the Homelite H26-260L is a great option for the casual user that takes on simpler projects. Impressive 5,500 RPM speed rating. 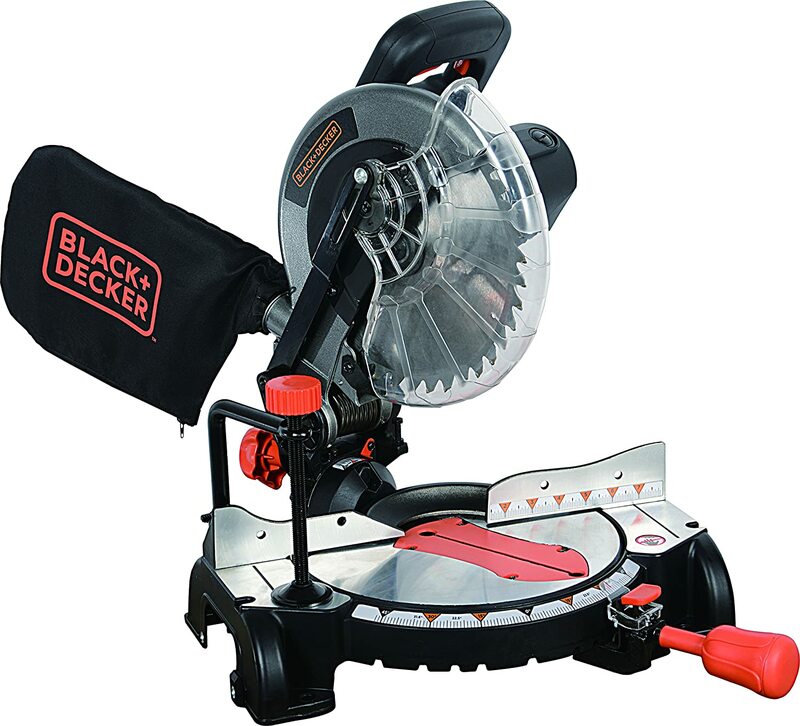 Our last review is on the Black & Decker M1850BD. It’s the smallest model on our list but don’t let yourself be misled by the size and price range – it’s a great miter saw for the right purposes. Using a 7.25” blade powered by a 9A motor running at 5,000 RPM, the M1850BD fits right in line for the hobbyist or DIYer that has smaller and less complicated projects to tackle. You can make miter cuts up to 45° in each direction (with stops at the common angle settings), and the single bevel adjustment of up to 45° gives you the ability to cleanly pull off those tricky cuts. Features such as a slider for the saw head and some sort of blade position indicator are not options, but it’s important to consider the M1850SD for its’ intended use. It is a no-frills, cost-effective solution for those that need to make some complicated cuts every now and then but can’t justify the cost (or capacity) of miter saws in the mid to higher end of the product range. Each different brand and model of miter saw carries its’ own set of benefits and features, but there are some basic points that need to be considered regardless of the model. Let’s take a look at some of these so that you can make the best buying decision possible. 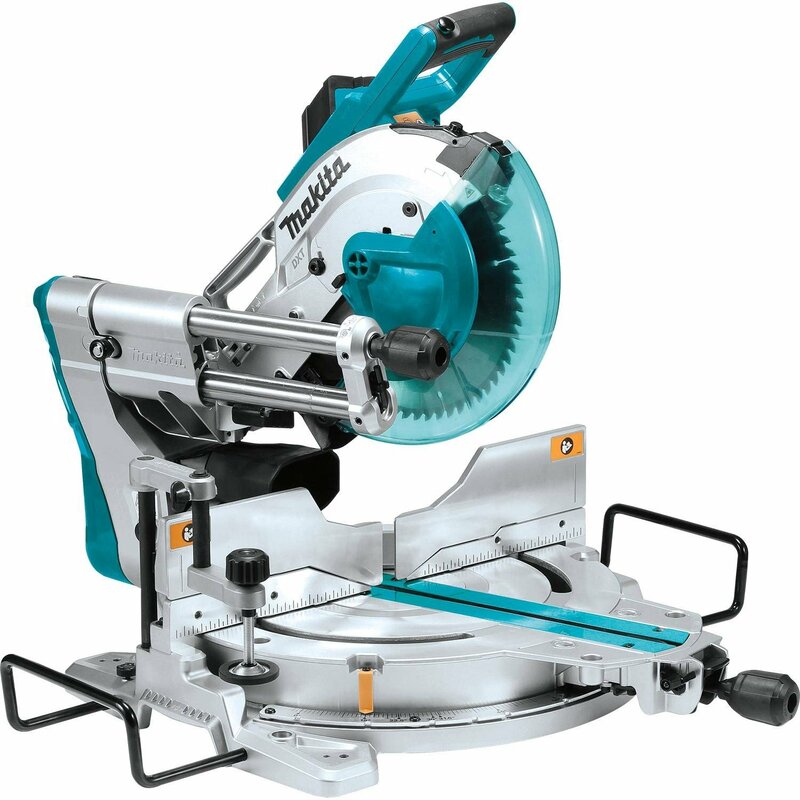 Miter Saw – The basic miter saw will be able to bevel in one direction and cut miter angles in one direction. From there you can perform the calculations to create the rest of your cuts. 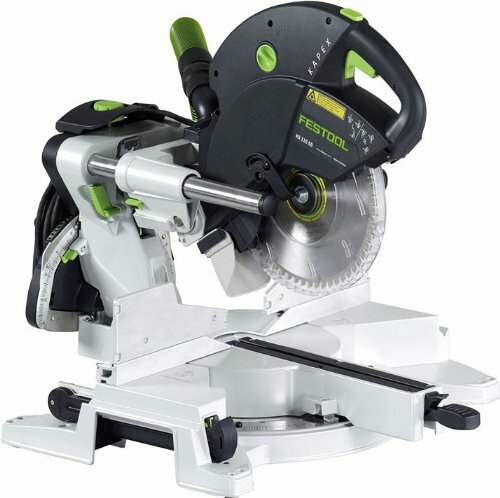 Compound Miter Saw – This is the new entry-level standard. Most miter saws have a cutting table that allows the saw to be angled left or right, making angled cuts in either direction without having to calculate the inverse of the angle you need. Just pop the lever on the detent plate and then swivel the saw. Most of these still have a single bevel, which makes them a single bevel compound miter saw. Single/Double Bevel Miter Saw – The can tilt from one direction or the other to create a bevel cut. This is great for cutting pieces of trim that you need to join together in a corner. A single bevel means that the saw only tilts in one direction, forcing you to flip the wood over to cut the opposite Bevel. A Double bevel allows you to angle the saw in either direction, which can be handy when working with bigger pieces. Sliding Compound Miter Saw – Most miter saws can only saw the width of its blade. A 10-inch blade can easily cut wood that is slightly under 10 inches in width. Borrowing a design from the radial arm saw, some Miter saws come with a sliding action that allows the saw to slide forward for added width. Knowing these definitions can help. 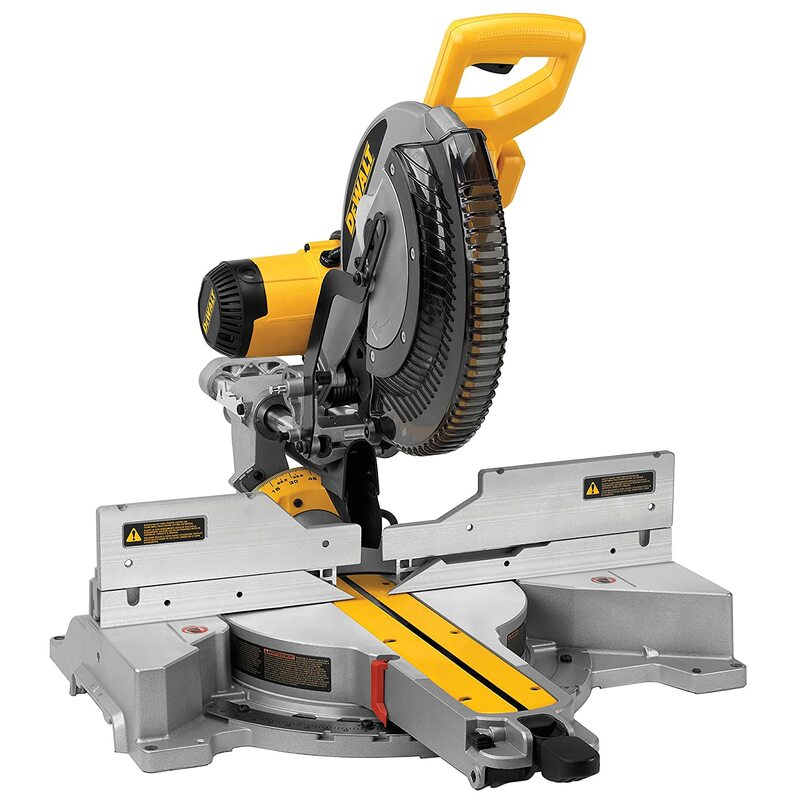 A Double Bevel Sliding Compound Miter saw is a saw that can cut angles or bevels in either direction and can slide forward for added cutting capacity. Power ratings for miter saws are given in terms of amperage. Amperage is a measurement of the amount of flow of electrical current and tells you how much power that the miter saw’s motor has available. It is given in units called “amperes” (“amps” for short). The more amps a saw has the more power it has to make clean and accurate cuts through the thickest materials. How many amps you need will depend on your general usage. 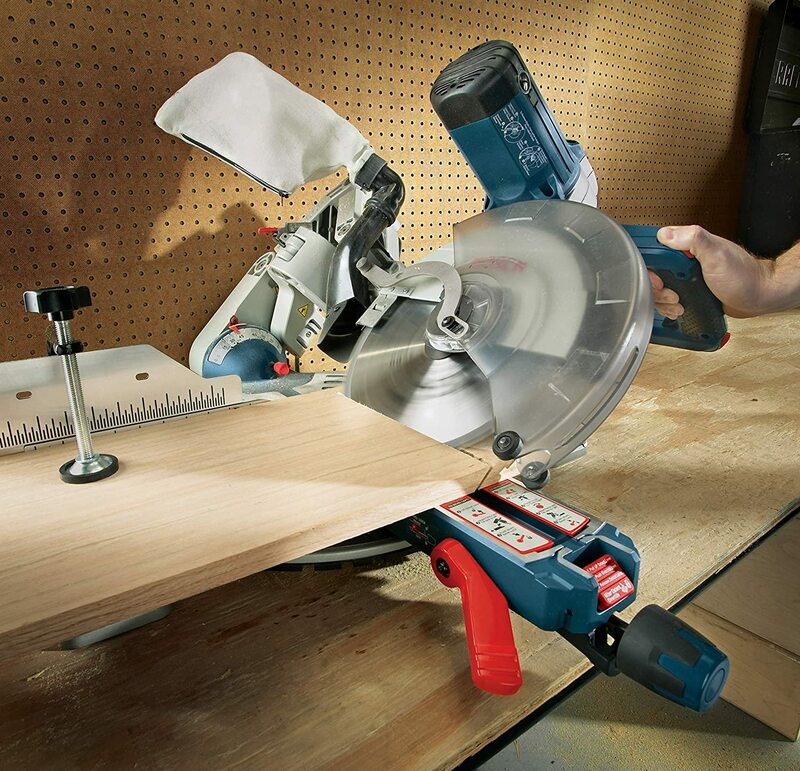 Miter saws typically range from 10 amps for smaller saws up to 15 amps for heavier duty work. An important consideration is if you plan on repeated use for those bigger projects then a larger motor will run longer without overheating. How fast a miter saw can run is a very important factor when considering the model that is best for you. Speed is measured in RPM’s, which stands for Revolutions Per Minute. The higher the number, the faster the circular blade turns. Simple enough, right? Whether or not a miter saw is the best choice for you shouldn’t be made just on the basis or power or speed alone. An important combination to consider is the amperage (power) rating plus the speed (RPM) rating in conjunction with each other. A 10 amp saw can have the same speed rating as a 15 amp saw, so the cut efficiency and speed can be relatively the same. A 15-amp motor won’t have to work as hard, however, which is why you will see motors with higher amperage ratings on the more professional level or heavy duty units. More power comes with a cost, though, so if you aren’t planning on heavy use or doing larger projects then you can save yourself a few bucks by getting a unit with a smaller motor. For most homeowner projects, a 10 amp motor may work just as well as a 15 amp. A contractor, however, will need a 15 amp motor if they are working at a commercial pace. Miter saws are not constructed to be used as a traditional table saw where the workpiece (typically wood) is moved against the saw blade. With a miter saw the workpiece remains stationary and the blade is “dropped down” to make the cut. Since the workpiece doesn’t move, the size of the blade is the biggest factor for how big of a cut you can make. Blade sizes typically range from 7.25” diameter up to 12” diameter. If you think that at some point you may need to make larger cuts then the smaller blade sizes may not be your best choice. Another consideration to make when looking at saw blade size is the actual type of miter saw. Some models have sliding heads on them where you can actually move the saw itself along straight guides. This will let you make longer cuts with smaller blades. A miter cut is used to create an angle across the width of the workpiece. If you think of the 45° cuts used to make a square or rectangular picture frame, those are examples of a miter cut. If the cut is to be angled through the thickness of the workpiece, then you will need a miter saw with bevel capability. Think of the end of a chisel and how its’ edge is beveled across the thickness of the chisel blade – that is representative of a bevel cut. There are projects where you may have to use a miter cut and a bevel cut at the same time. That is considered a compound cut due to the two different angles involved. 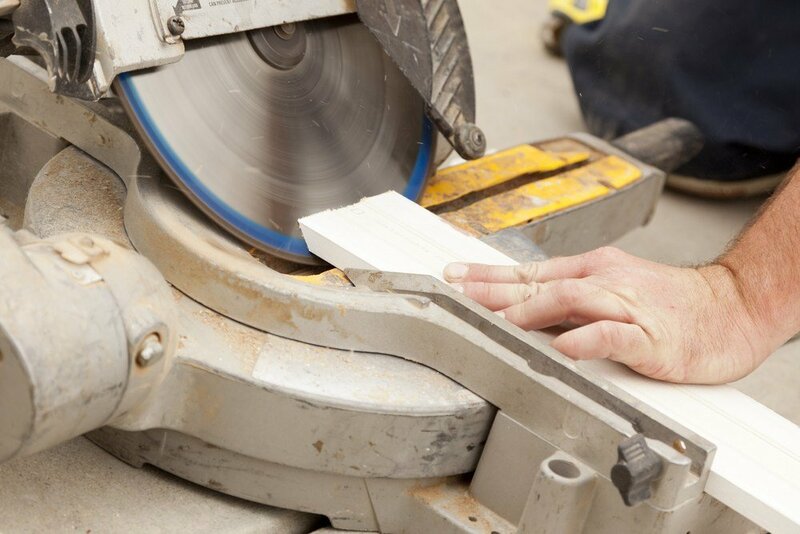 One of the biggest considerations with a miter saw is the capability it has to produce bevel cuts (cuts where the blade is angled through the thickness of the material instead of across the width). Depending on the complexity of your projects you should weigh the differences between a saw that has a single bevel or double bevel capability. Single bevel saws give you the ability to tilt the blade, but only in one direction (typically to the left). With a double bevel, you can tilt to the left and the right, greatly increasing your flexibility when making more complex cuts. It’s noteworthy to mention that single bevel saw can make the same cuts like a double bevel model, but it will take you longer to achieve the same results as you have to flip the workpiece. That can be cumbersome if you have a lot of complex cuts to make. 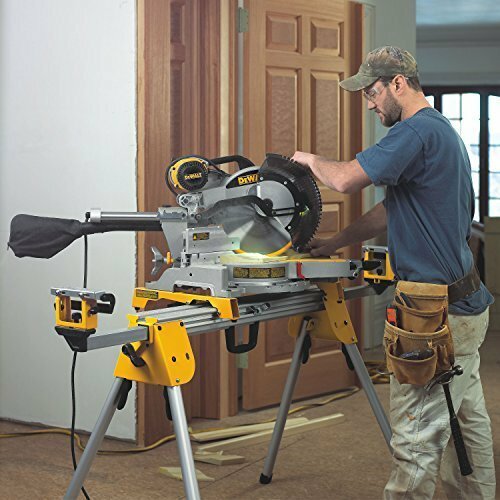 There are several distinctions between a miter saw that was designed for lighter duty jobs as compared to ones that will take the repeated heavy use that a professional will put it through. Professional units typically have larger motors to withstand heavier use. In addition, the overall construction and quality of components (such as bearings) in a light duty model may not be as beefy or as robust as that of the pro models, leading to the cuts becoming inaccurate over repeated use. Pro models oftentimes have heavier metal housings and table surfaces as well. If you want to keep your work area clean then having a built-in port for dust collection is important. From what we’ve seen there isn’t a hard standard for the size of the port between manufacturers, but you can easily create a dust collection set up by using a standard shop vacuum in conjunction with various hose adaptors. 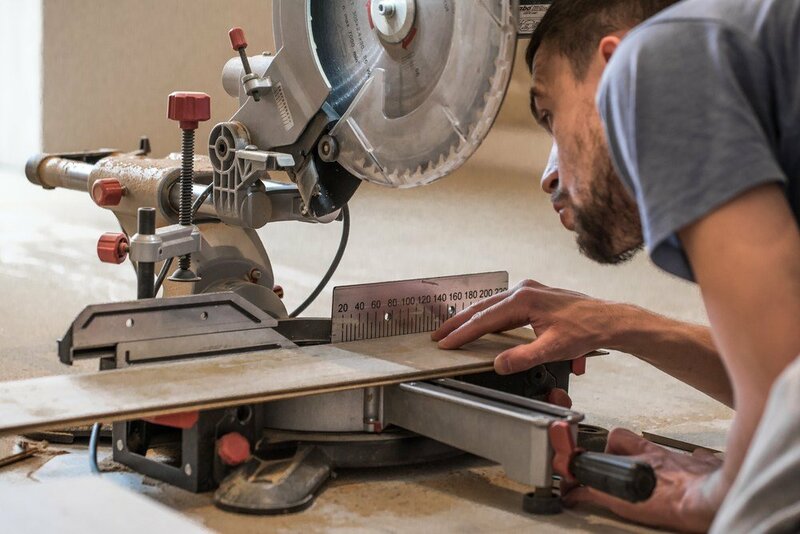 Miter saws are very versatile tools that can speed up angle and crosscuts on just about any project, from small crafts up to larger professional jobs that a contractor would take on. As with most power tools, there s a range of prices, build quality, and features, and there is sure to be one particular model that rises above the rest based on your planned usage and budget level. 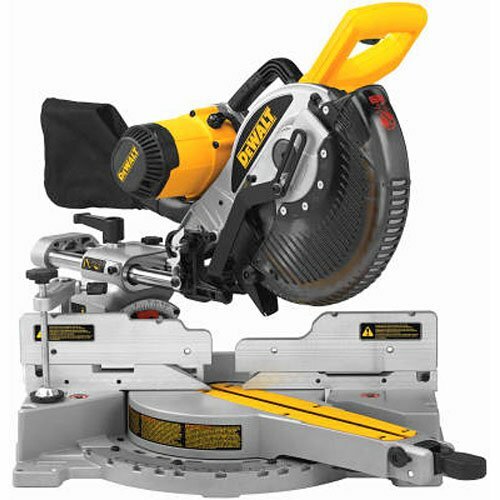 Taking all of those factors into account, in our opinion, the Dewalt DWS780 is our choice for the best overall miter saw that you can currently buy in 2019. No tool may be the perfect fit for you, but we think that the DWS780 comes pretty close! 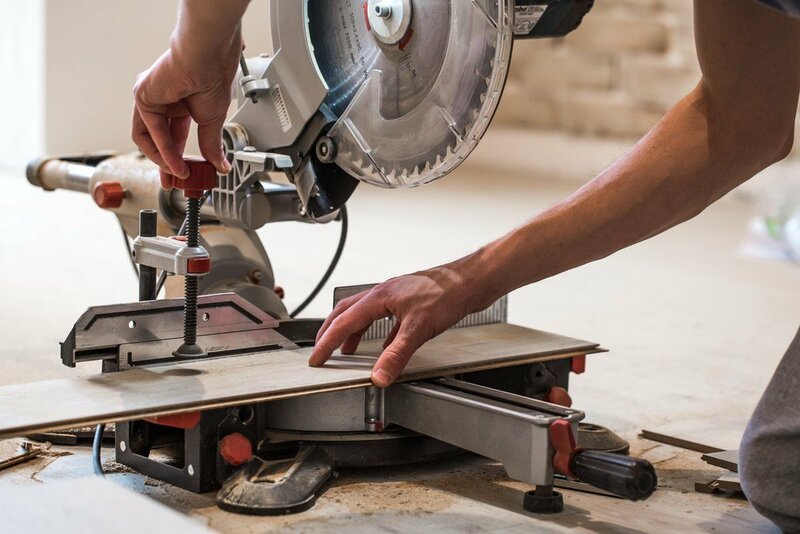 Making the right purchasing decision isn’t the easiest thing to do, but if you take the time to consider all we have discussed you should be able to find the miter saw that will be the best fit for you.